Hiding beneath the different types of eggplant, not far from zucchini flowers and plump, beefsteak tomatoes, I spotted some curious-looking lumps that ranged in colour from yellowy-green to purplish-red. 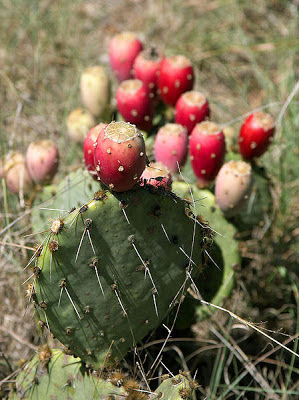 We were in Rome, and I had discovered the prickly pear, also known as cactus fruit. Strange looking things, which turned out to be cactus fruit. I rinsed the fruit under running water, picked out the reddest and softest specimen, and cut it open. The flesh was sweet and juicy. Not bad, I thought, but it's bit of work trying to eat around the hard seeds inside. I felt a little something on the side of my finger, and barely made out a tiny prickle sticking out of my skin. I absent-mindedly pulled it out, and kept eating. Cross section of a cactus fruit. But wait, there's another. And another! My hands are covered in these little needles. What had looked like smooth, spike-free fruit turned out to have invisible defenses called glochids. Some of the bristles broke when I tried to pluck them out, leaving an end still in my skin. Some got transferred to another place, with a couple ending up on the backs of my hands somehow! I couldn't keep eating. I washed my hands and hoped the barbs would just fall off. 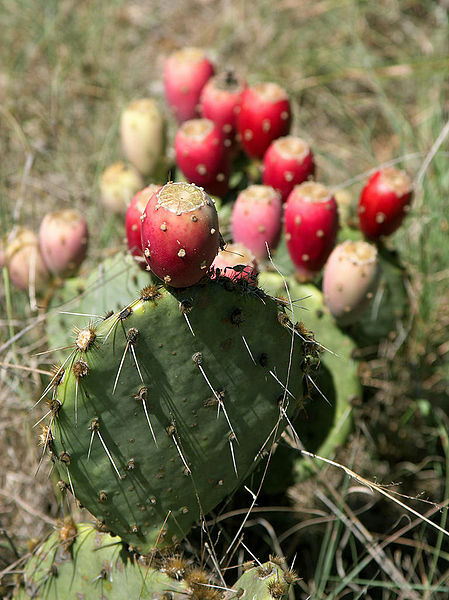 Prickly pear still on the cactus, shamelessly lifted from Wikipedia. The next day, my hands were still feeling irritated. And because I hadn't cleaned the table properly, I picked up a couple more prickles. I gave up, and threw the rest of the fruit away (they were still green anyway). Would I eat them again? Only with extreme caution. I might have to try burning the tiny spikes off, as some people seem to do. Or cook them away in a jam. I have nothing against the flavour of the fruit, but trying to eat them the way I did is more trouble than it's worth. Prickly pears at the supermarket, below the eggplants. Prickly pears at the market.